Are Online Games your Digital Destiny? This could be the template of so many random chats I’ve had with strangers. All while playing instant online games. Guess the Sketch and Scrabble have been my poison, over time, on Facebook. And as much as you get addicted to the games online, you also like your regular set of people to play them with. They are not ‘friends’ per se, but you have a comfort level that makes the experience enjoyable. You know that they won’t cheat on you just to grab a few extra points. The conversation is never sleazy, and you can take a break of a couple of days and return to the game. They will be there, waiting patiently, for their turn. Yes, there is subliminal comfort in the known. Guess the Sketch, for the uninitiated, is online Pictionary. You draw a given word within a time frame, and if any of the players can guess it, you win. I met two very fantastic women out there, in different time zones. One from the US and the other from Australia. The connection was such that nine times out of ten, we’d guess each other out. The logical thing was to add each other as friends. Incidentally, both of them were going through a rough patch in their lives. I’d gathered that from their status updates. I’d post support messages and urge them to be strong. It was the least I could do. My Australian lassie was a gorgeous lady. She was the only one who made ‘bold red’ hair colour look piping HOT! She saw it through rain and storm, and one day a beautiful status message popped up. X and Y are in a relationship. I was so happy for her. I just was, and I still am. And I hope to cover the distance and meet her in real-time someday. Who knows, maybe her wedding? Or host her when she travels to India? As long as there is the internet, there is eternal hope that we will remain connected. If I haven’t told you already, girl, I admire you. 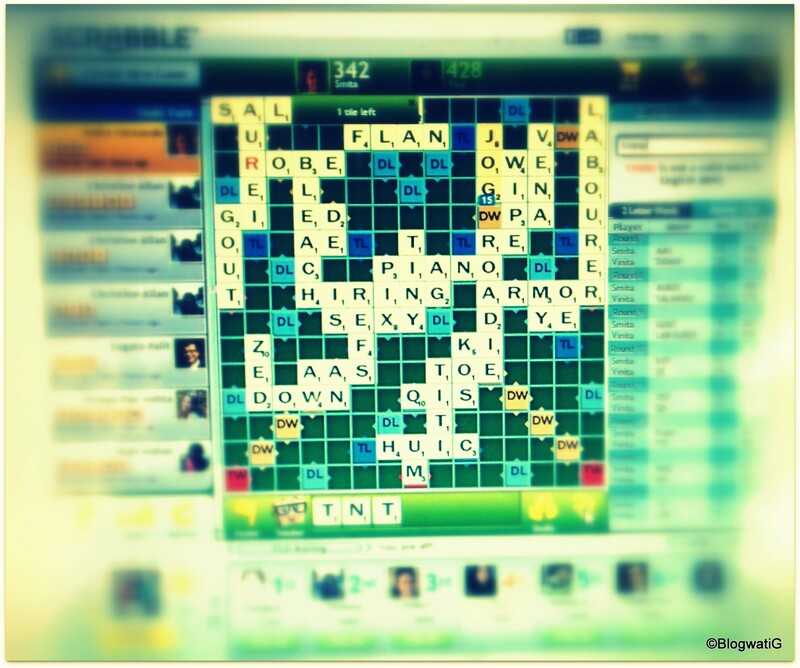 Scrabble was one of the first online games I latched on to. So, I meet this dude and we have a good number of games. He stays in Hong Kong and is big time into Tennis, he says. I’ve known more than to trust everything at face value. But as it turns out, he was telling the truth. He became my consistent Scrabble partner. He graduated to my itinerary planner when I was visiting Hong Kong in 2011. I thought I’d meet him, but we were on a schedule, and he was working. It looked difficult. And then as luck would have it, both of us had flights on the same day, at the same time, from the same terminal, but adjoining gates. I told him we had to meet. He agreed, and we planned to co-ordinate. So, while I waited to board the plane and the staff wondered why I would not enter the aircraft when my husband and daughter already had; I kept checking my watch. I periodically scanned the crowd for a tall, lanky fella and then I saw him. We greeted each other warmly. Knowing that we had planes to catch, there was no time for long conversations. Yet, both of us had put a face to the online name we knew. It was quite surreal. Four years down the line, we are still scrabble partners. Currently, he is on a honeymoon break. So here’s wishing him a lifetime of ‘Love, Set, (&) Match’. I am so happy for you, big guy. Congratulations, once again. There was this other Scrabble dude, about two years ago. Our convos were more fun than the game itself. It was a war of words which we both enjoyed. He apparently read my blogs, too. One day he mentioned that he was looking to make a foray into the writing world and asked if we could meet. He also added I was free to refuse, and that he was relocating to Delhi, shortly. He looked safe, and more importantly was not going to be in the same city, so we met. We had coffee, and we talked shop. He asked me to look up Anuja Chauhan, emphasizing that I would like her brand of humour (and he was right). He relocated, we continued the game of scrabble. Sometimes, taking a turn after a month. A hello here and there. Are we best buddies? No. We are just two parallel virtual presences that share similar interests, once in a while. And then we get back to our lives. Over a period of time, these random online profiles become an extension of your life, in some minuscule way. They seem more real than some of the ‘friends’ you know in daily life. And you are left to wonder, friendships come in all shapes and sizes, countries and continents, no? I never asked for any of this any more than the others did. Yet, our lives got entwined by some social network intervention. Sitting far, far away, in the comfort of our homes, we touched lives in some fleeting moments. Somewhere, I believe this was our digital destiny. Do you have any digital friend stories to share? Serendipitous encounters like these are always so nice! Quite terrible to hear about your friend’s passing. I had a similar incident happen to me once, too. There was once an American colleague whom I had interacted with briefly over some emails and a couple of phone calls. And then I found out that he had committed suicide some time later. Somehow, even though we had never met, that affected me a lot. I tell you RK, I never knew it would affect me so much. And you are right, even though we had never met, it was a relationship in some virtual way. Sorry to hear about your friend, too. I can only say, I know how that feels. May both of them, our friends, rest in peace.